First California Company hosted a January 7, 2011 visit of about 50 of our members and DeAnza Chapter of DAR to the Riverside Branch of the National Archives at Perris, which serves Southern California, Arizona and Clark County. Nevada. After a short business meeting and announcements of our next two meetings (see the Next Meetings side bar) Kerry Bartels, Archives Specialist and lifelong genealogist, explained the history, purpose, relevance and resources of the National Archives for researching ancestors. He followed his presentation with a tour of the facility. The National Archives and Records Administration (the “National Archives” and “NARA”) holds over 10 billion paper documents, many of which are rich in genealogical value but are little known and little used by genealogists. They are complemented by millions of electronic and other media and records, such as photos, maps, charts, architectural drawings, etc. NARA was established in 1934 to preserve, protect and make available to the public our government’s valuable records. Its Washington, DC headquarters houses the central government’s records from its inception up to 1900, and a newer facility in College Park, MD holds those from post-1900 and specialty departments. NARA also has facilities in branches in its twelve regions that offer access to those archives, but also hold official papers from their particular geographical areas. For example, the Pacific Regional Archives has two branches. The Riverside Branch, where we met, is the repository for southern California, Arizona and Clark County, Nevada. The San Francisco National Archives Branch is in San Bruno, California. Its holdings are from northern California, Guam, Hawaii, Nevada (except Clark County), American Samoa, and the Trust Territory of the Pacific Islands. However, it should be noted that, with respect to our own Jamestown genealogical needs, most of NARA’s archival collection dates from 1787 and the founding of the country, with relatively few colonial-era records. Those are mainly found in state and local archives. Mr. Bartels observed that over 80% of NARA’s documents and records have not been digitized and are thus unavailable through its online links, but can be accessed by in-person research and direct e-mail contact with its staff both locally and in Washington. He can assist and be reached at kerry.bartels@nara.gov. The key to using these records is that they can be located in NARA’s Archival Research Catalog (“ARC”) at http://search.archives.gov/query.html?qt=ARC&submit=GO&col=1arch&col=social&qc=1arch&qc=social. Look for the “How to Search in ARC” link on that page. However, Bartels cautioned that the digital utility of the archives is complex and difficult to navigate. The place to start is http://www.archives.gov/research/genealogy/start-research/. Local online research tools can be found at http://www.archives.gov/pacific/archives/riverside/genealogy.html. Ancestry.com (for general databases) and fold3.com (for military databases). 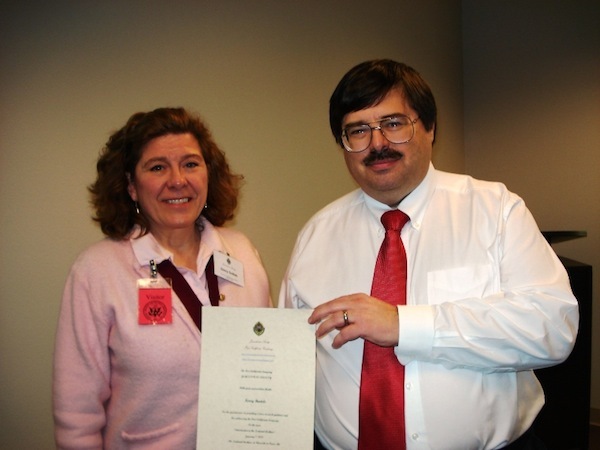 Governor Ginny Gotlieb presented Mr. Bartels with a certificate of our appreciation. Thanks to Charlotte Gresham for her photos. This entry was posted in 2012, Early American History, First California Company, Gotlieb, Jamestowne Society, National Archives. Bookmark the permalink.